MEDIA ROOTS – When confronting the global crisis waiting on Earth’s doorstep, most people deconstruct the bulk catastrophe and break it down into more palatable, bite size pieces. These smaller pieces are easier and less frightening to consume. No one dares to face the painful truth of reality as a whole. But there is one movie that has defied the status quo, rejects the fear and valiantly plunges forward, realizing that it would be fatal not to analyze global challenges as a systemic whole: Crisis of Civilization. The provocative 2011 documentary examines an array of global crises as its own ecosystem of sorts, rather than as isolated, discrete events. When taken as a composite, these crises pose an imminent threat to humanity and civilization as we know it. Director Dean Puckett leads the viewer on a tour through a plausible and, frightening scenario, using the expert commentary of Dr. Nafeez Mossadeq Ahmed. The documentary relies on the help of animator Lucca Benney and uses several clips from campy educational films to provide an amusing visual flow that offsets the gravity of the issues discussed. The seamless insertion of these scenes offers a brief recess from the incisive and grim sociological, political, and economic insights served by Dr. Ahmed. He is the sole expert interviewed throughout the documentary which potentially compromises the film’s objectivity but given the topics discussed there may not be a reason to tap anyone else’s knowledge. Dr. Ahmed boasts a very impressive array of credentials and while calm and collected, he warns of a world that faces a tidal wave of massive and radical change. The film acknowledges that the four main crises presented are not new. Many people before him have identified climate change, energy depletion, food production and economic crisis as major areas of concern. However, standard academic procedure examines each one of these issues in isolation, rather than in a holistic manner. The movie suggests that by framing these crises in a macro-perspective, the resulting synergy becomes the impetus of a failing global system. The system’s fatal flaw is due to a zealous belief of infallibility for neoliberal capitalism. This doctrine assumes unlimited growth and globalization but no longer suits the needs of the vast majority of people around the world. In order for these overwhelming challenges to be rectified, the film emphasizes that society must recognize the fundamental interconnection between all four crises. Unfortunately, the documentary falls a bit short on complete remedies. However it does provide some basic ideas of how the world could tackle the arduous process of systemic change. Part of the solution is to decentralize and regain land ownership. A new emphasis must be placed on localization and “participatory forms of organization and agriculture.” The overwhelming majority of people are currently dispossessed. Who owns the land? How can we reclaim it for the productive use of our local communities? It may be unrealistic to think all the solutions have been introduced in this film given the depth and breadth of the crises presented. Due to the United States’ neoliberal agenda and mass consumer culture, many have created their own crises. Quality solutions to many of today’s issues will not be resolved until civil society is honest enough to first recognize the totality of such problems. 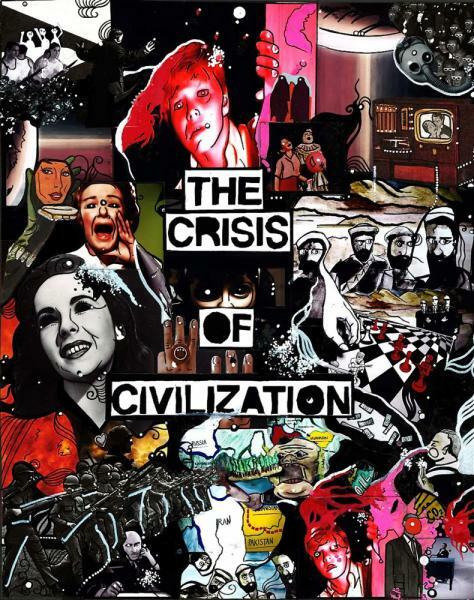 Crisis of Civilization does a fine job starting that search. Reviewed by Adam Miezio for Media Roots. Artwork provided by Abby Martin. On Monday, Media Roots will offer interviews with the film’s director, Dean Puckett, and narrator, Dr. Nafeez Mossadeq Ahmed. the symptoms that will cause the end of the industrial age.